So here we go! I’m excited to co-author MinistryFamily.com with my wife about our experiences growing up with pressures and expectations as Pastors Kids, what we learned from it, and caring for our own marriage and kids in a ministry family. While feeling unqualified, my wife and I may be uniquely positioned to talk about this subject because we both grew up with fathers who served in full-time pastoral ministry. In fact, both of our dads are still serving as senior pastors today! And now that Dana and I have served in full-time ministry both as singles and as a married couple with children, we totally know how ministry can be tough on families, children, marriages, finances, and our personal walk with Christ. I’m not exactly sure what all God is going to lead us to write about being a ministry family and the unique challenges therein, but I am excited to see what comes of it. Dana already has several great posts queued up and I have an idea for a “ministry family” video series I’m working on while publishing blog posts along with her. Hopefully MinistryFamily.com will encourage you, help you avoid some mistakes we experienced, repeat some things our parents did well, and especially give voice into some of the things Dana and I will publicly discuss concerning our own marriage and parenting in a ministry family. Be sure to subscribe to MinistryFamily.com! 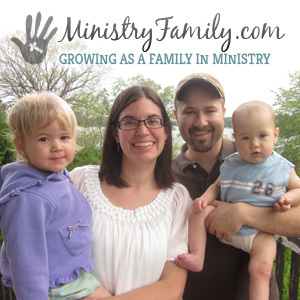 Please help us spread the word about MinistryFamily.com by blogging about it, sharing it on Facebook and Twitter, including it in an email blast, and anything else you can do! We really appreciate your help in giving MinistryFamily.com a solid and successful launch! Thank you so much!